Ten years ago, on 13 December 2007, the Heads of State or Government of the Member States of the European Union signed the Lisbon Treaty. They agreed amongst others “on the progressive framing of a common defence policy that might lead to common defence”. It needed however several years before these words changed into real action! On 28 June 2016 the High Representative Federica Mogherini launched the EU Global Strategy. In July 2016 the Presidents of the European Council and the European Commission, together with the NATO Secretary General signed a Joint Declaration in Warsaw with a view to giving new impetus and substance to the EU-NATO strategic partnership. 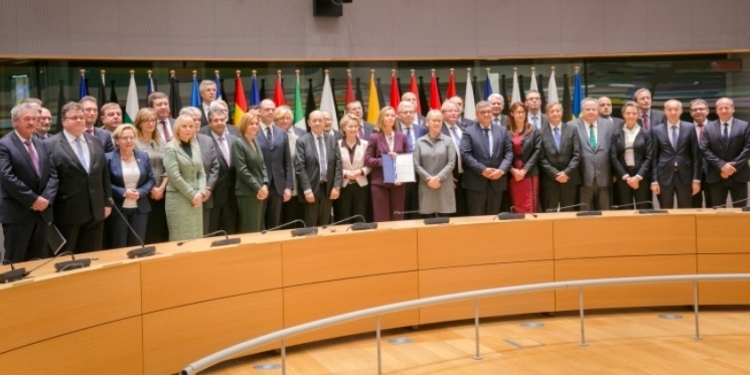 After the HRVP Mogherini and the EU Defence Ministers agreed in an informal meeting in Bratislava to move forward on European Defence, the HRVP proposed an Implementation Plan on Security and Defence in November 2016. In the same month the European Defence Action Plan (EDAP) was put forward by the European Commission. Only one month later, in December 2016, EU and NATO Foreign Ministers endorsed a common set of proposals of 42 concrete measures in seven areas of cooperation. At the same time the European Council endorsed the ‘defence package’: the Implementation Plan on Security and Defence, the EDAP and the proposals for the EU-NATO cooperation. Several actions during the first months of 2017 led in June 2017 to the agreement of the European Council on the need to activate a Permanent Structured Cooperation (PESCO). Hereby they expressed the will to cooperate more closely together. Meanwhile the Military Planning and Conduct Capability (MPCC) has been established and several initiatives such as the European Defence Fund and the Coordinated Annual Review on Defence (CARD) came on the table. Already in July 2017, the defence ministers of France and Germany, soon joined by Spain and Italy, drafted a first proposal on PESCO and forwarded it to defence ministers of the European Union. Many meetings later, 23 Member States signed in November 2017 a ‘common notification’ expressing their interest to participate in PESCO. The notification included the list of binding commitments, by which the participating Member States declared that they are willing and able to fulfil the requirements of PESCO. One month later also Ireland and Portugal notified their decision to join PESCO, which increased the number of participating Member States to 25. In December 2017 the Council adopted the decision formally launching PESCO. The participating Member States also agreed on a declaration, expressing their intention to prepare the first 17 collaborative PESCO projects. And finally, the European Council on 14 December 2017 “welcomes the establishment of ambitious and inclusive permanent structured cooperation (PESCO) and stresses the importance of quickly implementing the first projects; calls on participating Member States to deliver on their national implementation plans”. “And this is the European Union of security and defence that we have started to set up. And to do this, we have put together quite an impressive number of new instruments, not for the sake of creating new structure or instruments, but simply because they were missing in the toolbox the world of today requires in the field of security and defence.” High Representative Mogherini said at the “Building on vision, forward to action: delivering on EU security and defence” event on 13 December 2017 in Brussels. Without a doubt, the launch of PESCO and its first package of projects is a milestone for European Security and Defence. In the past weeks several declarations about this event have been made, some of them rather positive, others more negative and some realistic. For EUROMIL the glass is rather half full than half empty! The commitment of 25 on 27 Member States to collaborate more and better on basis of binding commitments, is a big step forward. However, we repeat once again that one of the essential factors in making PESCO successful in the years to come, are the men and women – the European soldiers and defence employees – that need to implement and execute the political will for closer collaboration. And these men and women are unfortunately forgotten in the launch process of PESCO. Even if some of them were standing beside the Heads of State or Government of the Member States for the official ceremonial launch, the human and social factor is, as already stipulated in our PESCOarticle at the occasion of the notification of PESCO, missing. It will be a challenge, EUROMILs challenge, to convince participating Member States to bring these important factors into some of the projects. The question is where all these decisions will lead to? Stronger cooperation and collaboration is needed, but what is the final goal? It would be a good thing if all stakeholders could finally use the same words, aiming for the same goals and working together towards achieving them. Let’s be fair, the message changed already several times in the past years and I am not convinced that everybody, in despite the binding commitments they agreed on, has the same final destination in mind. Allow me to quote the German Defence Minister Ursula von der Leyen during the 26th annual Summit of Chairmen of EPP Parliamentary Groups: “We are developing more transparency and cooperation in the European Defence Union. This does not mean a European army, but an army of Europeans, in which decisions to send troops will remain in the hands of Member States.” Not long ago, in September 2017 in his State of the Union address, Jean-Claude Juncker however called for the creation of a EU military force saying “We need it. And NATO wants it. (…) We need a fully-fledged EU Army by 2025” Juncker declared. It would be nice to have a crystal ball to see were European security and defence and its hundred thousand of men and women will finally land!